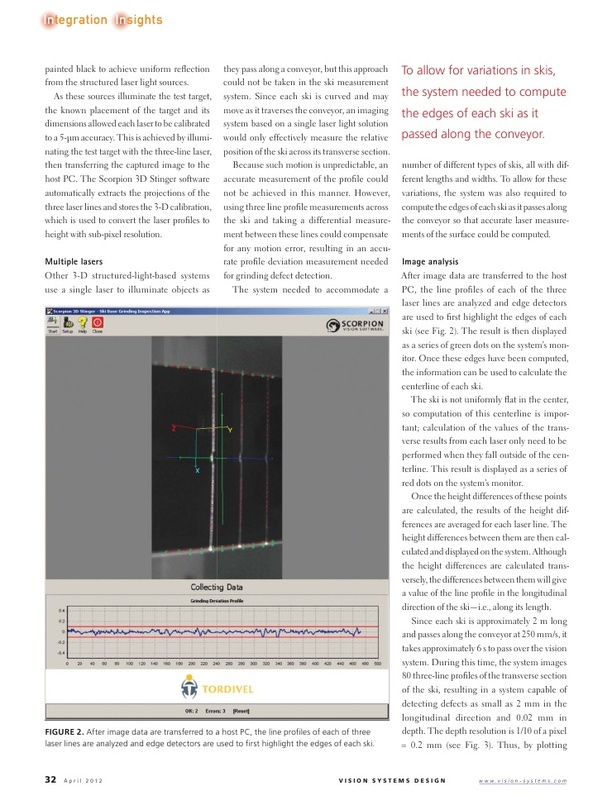 Madshus enlisted Tordivel to develop a laser-based profiling system that computes the surface detail of the base of each ski as they move along a conveyor at 250 mm/s (see Fig. 1). Due to the nature of the base grinding process, any defects will appear in a longitudinal direction along the ski. To detect defects as small as 0.02 mm in depth and 2 mm in length, the Tordivel system illuminates each ski as it passes along a conveyor with a structured laser light unit from Coherent. FIGURE 1. 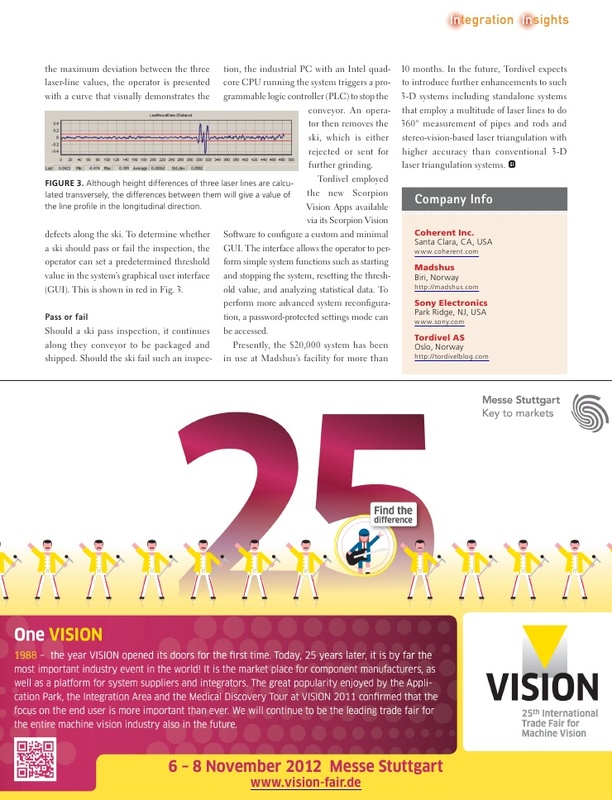 Tordivel has developed a laser-based profiling system that computes the surface detail of the base of skis as they move along a conveyor at 250 mm/s. Embedded in Tordivel’s Scorpion 3D Stinger camera system, this structured light source illuminates the transverse section of the ski with three structured laser lines. Reflected light from these lasers is then imaged using a 640 × 480-pixel V60 GigE camera from Sony that is also embedded in the Scorpion 3D Stinger. Placed 250 mm under the conveyor, the 3-D camera system captures images at 90 frames/s and transfers them over the GigE camera’s interface for real-time processing. 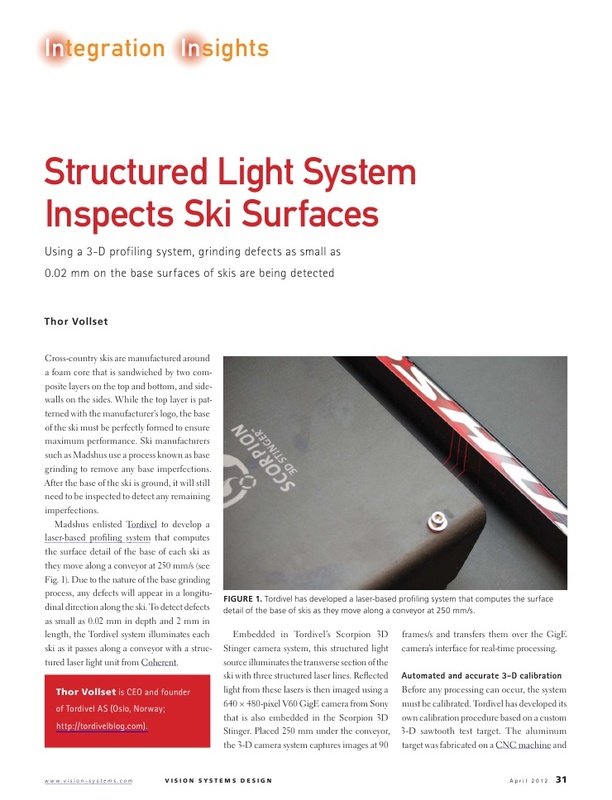 Structured Light System Inspects Ski Surfaces.